ATK conceded a late equalizer away from home to Kerala Blasters as the Hero Indian Super League (ISL) returned to action for the first time since the mid-season hiatus last month. The visitors struggled to make the best use of the ball and were forced to play catch-up for the majority of the game under the lights at the Jawahar Lal Nehru Stadium in Kochi on Friday. 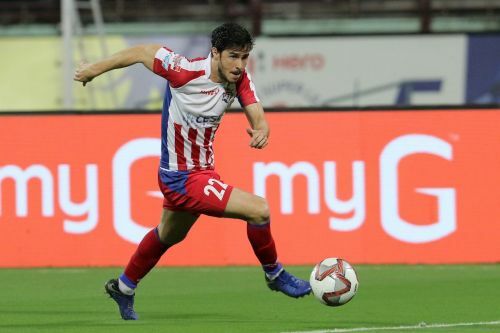 Despite their insipid performance on the night, ATK were lucky enough to take the lead through Edu Garcia, who joined the club from Chinese second-tier outfit Zhejiang Greentown earlier this month. The Spaniard was named 'Hero of the match' for his goal-scoring debut for Steve Coppell's side and looked head and shoulders above his counterparts on the pitch. Garcia scored from a free-kick awarded to ATK in the 85th minute, when he expertly struck the ball beneath the wall and beat Dheeraj Singh Moirangthem by finding the bottom corner of the net. However, the Kerala Blasters ensured they walked away with at least a point after restoring parity through a late scrappy goal that stemmed from the determination of Matej Poplatnik and Gerson Viera's touch that took it over the line. In the wake of their demoralizing result against the Kerala Blasters, Garcia admitted he cannot be happy, despite marking his return to the ISL with a well-taken goal. The Spaniard also conceded that ATK have not achieved what they were set out to do, since they arrived in Kerala and did not shy away from expressing his disappointment with the outcome of the game. “I’m not happy [despite scoring on my debut for ATK]”, Garcia told Sportskeeda after the game against Kerala Blasters on Friday. “This is not what we wanted when we came to Kerala, we wanted the three points, but we couldn't get it in the end. “It’s another point taken though and we must keep on working [to improve]. “I’m happy for coming back to India and returning to the Indian Super League. Of course, to be back with a team like ATK is quite pleasing, but I cannot be happy today. “The result is not what we wanted and I think it is not good [enough] for us." Garcia enjoyed a stellar league campaign with Bengaluru FC last season and it subsequently earned himself a big move to China when Zhejiang Greentown came calling for his signature in February last year. The 28-year-old put pen-to-paper on a contract with the Chinese second division outfit and moved on to a different challenge, before eventually deciding to return to India earlier this month. Garcia, who made 12 appearances for Zhejiang Greentown in Chinese League One, did prove to be influential after netting three goals and notching up as many assists during his time with the club. However, the midfielder did not think twice when an opportunity to return to India came calling with the interest from ATK. The former Bengaluru FC schemer admitted he found it difficult to settle down in China and revealed the decision to return to India was made after considering the opinion of his family. Garcia also expressed his love for the ISL and reiterated on the fact that it played a huge role in his return to India. “I like India very much and the Indian Super League too", Garcia revealed to Sportskeeda. "It was a good experience in China, but I think the life there is more difficult than here, at least for me. Garcia, who is a product of the Real Zaragoza academy in Spain, will have to be at his influential best for ATK, if the two-time ISL winners want to make the playoffs this term.